LOUISBURG - Funeral services for Gwendolyn Steed Keith DeVault, 97, who died Wednesday, Oct. 16, 2013, will be held at 2 p.m. Tuesday, Oct. 22, at South Main Street Baptist Church, with the Rev. David Rosby officiating. Burial will follow in the Perry’s Missionary Baptist Church cemetery. LOUISBURG - Funeral services for John Alston Jr., 68, who died Thursday, Oct. 17, 2013, will be held at noon Saturday, Oct. 26, at Mitchiner’s Grove Baptist Church, with the Rev. Melvin Jackson officiating. Burial will follow in the church cemetery. FRANKLINTON - Steve Brent Morton, 60, passed away on Thursday, October 17, 2013 at Hospice of Wake County. Steve was born in Granville County to the late Elmo and Thelma Dickerson Morton on August 20, 1953. WILLIAM G. “BILL” HAYNES, JR.
LOUISBURG – William Grady “Bill” Haynes Jr., 53, died Wednesday afternoon, Oct. 16, 2013. 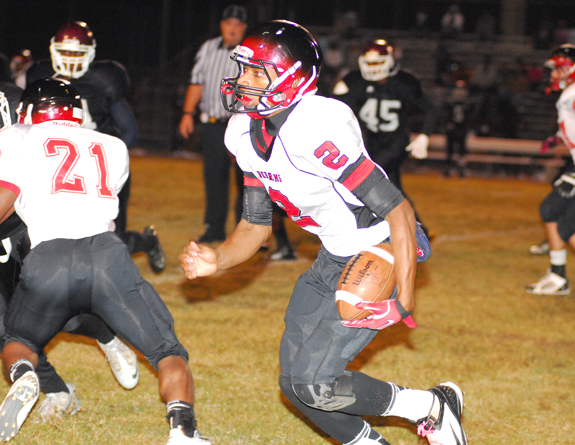 WARRENTON -- Franklinton’s uptempo spread offense and Warren County’s tight-bunch, run-oriented power attack provided quite a contrast during Friday’s crucial Northern Carolina Conference event at the WCHS Eagles Nest. The back-and-forth battle of wins wasn’t decided until Franklinton quarterback Daquan Neal found Jackson Hooton with a 7-yard touchdown pass with just 19 seconds to play. Bunn erupted for 21 points in the second stanza and went on to defeat Roanoke Rapids by a 28-18 margin on Friday in a key NCC showdown at the BHS Football Field.